This church dates from the 16th century and is known for its stained glass. The Église St-Acceul in Écouen has the distinction of being the only church in France with that name. Sitting just below the Château d'Écouen, the church was also built by Anne de Montmorency in the first half of the 16th century. It went through restoration and modification in the 18th and 19th centuries. The church is best known for its stained glass windows, most of which date from the 16th century. Ten windows were financed by the Montmorency family and created between 1544 and 1587. 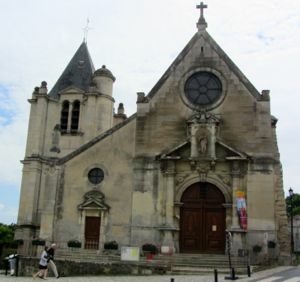 The Tourist Information Office, which is just across the street from St-Acceul, provides free visits of the church, with commentary, along with the Association Les Amis de St-Acceul. Above, L'Église St-Acceul, Écouen, France.